Tabletree | Welcome! Tabletree products – "No" preservatives! "Never" from concentrate – just pure fruit, and a touch of honey and cinnamon. Sometimes the latest research on nutrition involves a substance or supplement with an obscure name that only a scientist could get excited about. But other times, there is something absolutely delicious that, it turns out, is also great for you. Which brings us to cherries. With cherry blossom season in the air, now is a great time to celebrate the beauty of nature and one of my favorite fruits, the cherry. The delicious sweet and tart flavor of cherries is matched by remarkable health benefits. boron, a mineral that plays an essential role in bone health, especially for women. Cherries are important for their ability to control inflammation. A growing body of scientific research indicates that inflammation contributes to diseases such as heart disease, arthritis, and obesity. Sweet or tart, cherries are a powerhouse of anti-inflammatory nutrients. A study from University of California at Davis found that regular consumption of cherries for 28 days produced a decrease in biochemical signs of inflammation in blood, including a 25 percent reduction in C-reactive protein (CRP), the most widely studied marker of inflammation. Elevation of CRP in blood is associated with an increased risk of heart disease and stroke. According to research done at Michigan State University the anthocyanins that make cherries red could also help relieve pain more effectively than aspirin. The study found that anthocyanins were potent antioxidants that could prevent oxidative damage and also inhibited enzymes called cyclooxygenase-1 and -2 (Cox 1 and 2), which is similar in the way anti- inflammatory drugs seek to reduce pain. The study appeared in the Journal of Natural Products published by the American Chemical Society. Lead researcher Muralee G. Nair, Ph.D., Professor at Michigan State University College of Agriculture & Natural Resources, noted about this cherry effect “It is as good as ibuprofen and some of the nonsteriodal anti-inflammatory drugs.” Nair said that his lab results indicate that consuming 20 tart cherries could provide anti-inflammatory benefits. A presentation at the American College of Sports Medicine Conference found that drinking cherry juice helped reduce pain after exercise for long distance runners. This research, from the Oregon Health & Science University, indicated that cherries could act like medications that runners use to reduce inflammation after workouts. “For most runners, post-race treatment consists of RICE (rest, ice, compression and elevation) and traditional NSAIDS (non-steroidal anti-inflammatory drugs),” said Kerry Kuehl, M.D., a sports medicine physician and principal study investigator, who added: “But NSAIDS can have adverse effects — negative effects you may be able to avoid by using a natural, whole food alternative, like cherry juice, to reduce muscle inflammation before exercise.” Please see References below for the link to the full text of this interesting study. Reducing pain in sports would be a great benefit, given the pain that some professional athletes go through, which you can learn more about in: “ Football and Painkillers “ (See Below). Another study from the University of California at Davis found that a single dose of cherries reduced the blood level of uric acid in healthy women. Excess uric acid causes gout, a very painful type of arthritis. The use of cherries to prevent gout is well established in Western folk medicine. You can enjoy the benefit of cherries all year round with unsweetened cherry juice, unsweetened cherry juice concentrate, or frozen organic pitted cherries, which make a delicious snack or dessert. And don’t forget about incorporating anti-inflammatory foods like cherries into daily life. Here is a cherry recipe from my book, The Fat Resistance Diet, an anti-inflammatory program featuring foods that help cut inflammation. Peel and core pears. Put pear, water, cherry concentrate, lemon juice and cinnamon in a saucepan. Cover and simmer for 7-10 minutes or until fork tender. With a slotted spoon remove and plate pears. Simmer liquid until syrup is reduced to desired consistency and spoon on pears. Top with chopped almonds and mint. Serves two. Leo Galland, M.D. is a board-certified internist, author and internationally recognized leader in integrated medicine. Dr. Galland is the founder of Pill Advised, a web application for learning about medications, supplements and food. Collisions and bone-jarring injuries caused by football lead to chronic pain and use of painkilling drugs. We are cherry growers and processors here in Creston, B.C. Five years ago, we anticipated the decline of the fresh market and began researching value-added opportunities for our fruit and invented and designed a proprietary juice extraction machine new to the juicing industry. A huge loss in the fresh market in 2009, coupled with tremendous rain storms that left 200,000 pounds of split fruit on the trees, catapulted our need to commercialize our juice business. In 2010 we won 2nd place and the funding to bring our products to market in the B.C. Innovations Council CAT (Commercialization of Agricultural Technology) competition. We have returned from Cologne, Germany where we placed second in the category “Best New Nectar or Juice” for our Red Apple Juice. But the wonderful thing was that the other company that won was a Canadian company as well – Haskapa from Nova Scotia which is truly a new juice with the haskap berry. It was so great to have two Canadian companies standing together in the top two for the award and even more exciting for Tabletree being the second time that we stood on the world stage having won “Best Pure Juice Product” last year for our Black Cherry juice. 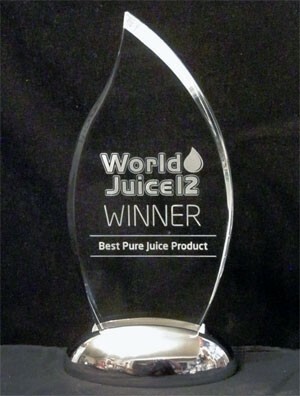 The awards were presented at the World Juice Conference in Cologne, Germany. Among the attendees were close to 350 participants from 55 countries from many of the top juice companies in the world and those corporations and agencies that support the juice industry – it truly was the world of juice. Of particular note, was the concern expressed during the conference in presentation after presentation of what would appear to be a worldwide problem of the decreasing numbers of farmers that the world is losing due to their inability to make a decent living. Locally, we lost one-half of the fruit growers we had last year and more have told us that they are giving up farming completely due to their inability to make a living. Banks are not funding “agriculture”. Here in Canada, we spoke directly to a major bank at a conference we attended and they said straight out that they were not loaning to agriculture, but looking at tech companies. Honesty on the part of the financial institution, but who will feed them in the future? Last year when we attended the conference in Spain we were disappointed that they didn’t focus on the farmer and their value chain and this year it was evident that the tides had turned and not only was North America experiencing the demise of the farmer, but the world as well. Many of the participants were eager to talk to us and we were used as an example during one of the keynote speeches during the conference by a large processor from Chile that we had befriended while we were there. He spoke to us about the need to increase the price of food in general, but we were concerned in that usually when the price of food increases, that increase is not passed down to the farmer, but to those links in the value chain above the farmer. Round table discussions were held wherein solutions to the value chain problem were discussed. Sitting at our table were leaders in the industry – many multi-million dollar processors from Spain, Chile, Denmark, and India, senior representatives from the worldwide Fair Trade organization, and senior representatives from U.K Walmart and others from all over the world. We were in awe just being able to sit next to these people in a room, let alone have them be interested in what we had to say. “The world” listened intently to us as we answered their questions. They wanted to know about our experiences and reasons for stepping up one rung in the value chain ladder from farmer to processor, and they recognized our story as being one of desperation to save the family farm. We asked them to produce what the public is looking for – healthy quality juices and to pass any price increase down to the farmer. We asked them to invest in agriculture and more specifically, the farmer themselves, to ensure that the farmer is profiting and thereby giving back to the economy of their respective countries. One large processor from Spain stepped in and stated the solution should be more large corporate farms and the streamlining of operations through these large entities. It was so refreshing and hit close to the heart to hear all but one of those major players at the table speak out in defense of the small rural farmer and the need for countries to support the small farmer and not the corporate farms. One wonderful man from India after hearing our presentation and then the executive from Spain, spoke up and said that India paid their farmers first. He said that the dairy farmers in India were the poorest in the country – that many could not even afford to have their own families drink the milk they produced. But little by little, they formed a service that picked up the milk from the farmer and the farmers with even just one cup of milk would come out with it and they would pay the farmer and take the milk and chill it or turn it into cheese and they would sell it. These farmers flourished and soon became the richest in India and India’s production of milk and cheese increased significantly and most importantly the economy of the country improved because the farmer was giving back to the community they lived in by the purchasing of goods and services. And this was all from supporting the farmer. Could it really be that simple? – one would hope so. We were wined and dined by many and we met a wonderful senior government official from South Africa who was enticing us to move our operations there. The government in South Africa has the ability to grant 80% of the capital needed to build a facility (non-repayable) if we worked with a South African company there. In her words “I would love for you to move to South Africa so I could give you some money!” I don’t think we would be interested in such an offer, but it saddened us to think that we hadn’t been approached by our own country yet for the same proposition, other than in an application process that will take a team of accountants and grant writers a millennium to complete. We now have two World Class juices, we have the world looking at our products, and we can’t seem to find support for our invention and expansion other than foreign countries, foreign investors and foreign companies. The sadness comes in realizing that in order for us to expand our company we will probably have to take a foreign offer in order to survive. But we will look positive towards the future in the hopes that this can be attained – that our country will assist the farmers directly and that our company can stay here in Canada in support of our community and the rest of the farmers. If we can expand our facility to include fruit from other farmers then that would be an end to a goal that we set in the beginning which was to support our fellow farmers as well. 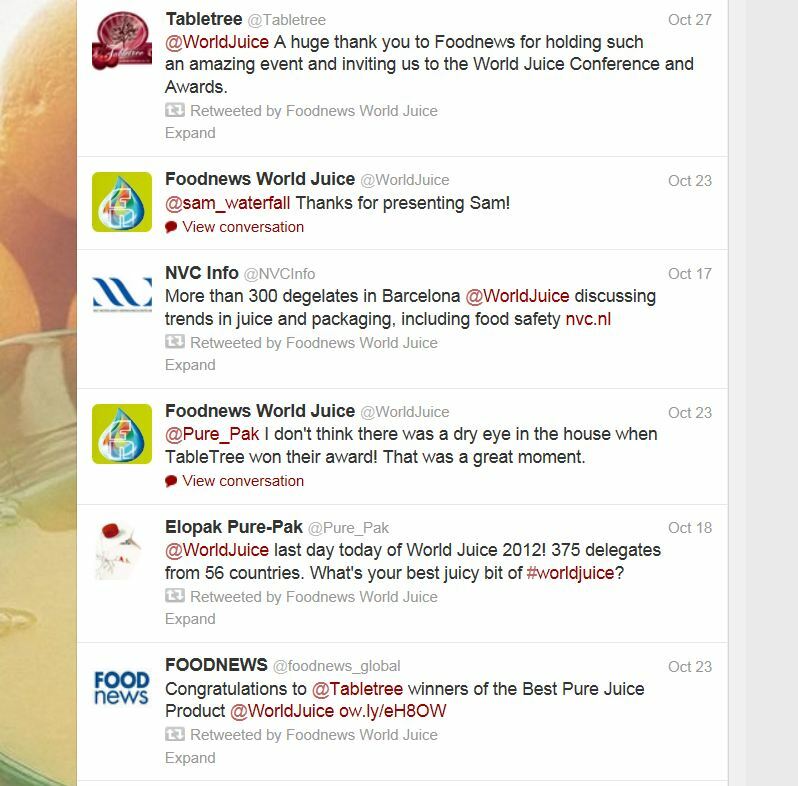 The “world of juice” is concerned and they are listening to the consumers demand and need to reduce their sugar intake. As it relates to the consumption of juices, an example was given of the different countries portion sizes when ordering juices. In North America when you order juice in a restaurant, you can be given a huge eight to ten ounce glass and in European countries, it can be considerably smaller. The smaller amount is the preferred portion size when considering the effects of sugar. Specifically noted was the need to educate people in proper portion sizes when consuming all juices. The health benefit of juices can be achieved in as little as an ounce of juice as is evident in our Tabletree Black Cherry juice. At Tabletree we encourage our consumers to use only an ounce a day and we are seeing wonderful testimonials from people being helped from everything from gout, to arthritis, to emphysema, to mesothelioma, MS, and Crones Disease. The health benefits of our juice in these instances far outweigh any damage being done by the natural sugars we would presume. Another topic of major concern was the shortage of water in many countries. It was suggested that the next wars could very well be fought over water. One of the key-note speakers noted that Egypt had built huge air conditioned facilities for their cows which required water for their operations as well as water for fodder for the cows. As their water levels can be measured from the ground, it was suggested that because of these huge massive facilities use of water, that where there was once hundreds of years of water, there is now only a century of water left. Saudia Arabia is not building any more factories because of their decreasing water supplies as well. Some countries, that are currently experiencing bad air and water quality are looking to the future and purchasing large tracts of land in other countries in anticipation of possible future problems. From that, it seemed obvious to us that we here in Canada need to protect what we take for granted – our water – and that we need to protect it for our future generations. Our most valuable resources are our children and our water. We feel very fortunate having been given the opportunity to attend not once, but twice, such a prestigious affair and you can imagine our excitement when we were asked by the Senior partner of the company that presented the first day’s workshop if we could be interviewed for a chapter in his next book about entrepreneurs and their path to success. We are still traveling that path, but the ride has been a wonderful one to say the least. Tabletree once again, stepped on the world stage but this time with our Red Apple juice. We came in second in the category “Best New Juice”. But the wonderful thing was that coming in first was another Canadian company Haskapa with their haskap juice which is truly a “new” juice. Congratulations to Haskapa and how wonderful to meet a new friend. And how wonderful to have two World Award winning juices! We had a wonderful time at the conference that was held in Cologne, Germany. We are busy coming up with a new juice as next year the conference is being held in Paris, France.